Do I need a New Roof? How to tell if you do. How to tell if you need a new shingled roof in CT. Call 1-888-766-3020 for a Free Quote today! Do I need a new shingle roof in Connecticut? How to tell if you need a new shingled roof. Call 1-888-766-3020 Today for any questions! Shown below are common symptoms that indicate it may be time for you to get a new roof. 1. Algae Growth: Algae growth causes a dark discoloration on roofs. The algae is usually brown to black in color which results in a streaked, dirty looking rooftop. It can be mistaken for soot, dirt or tree droppings, which typically produce only localized discoloration. It's caused by the growth of air-borne algae which deposits on your roof. The good news is that algae growth does not affect the service life of your roofing material. It occurs most often in warm, humid climates such as the Southeast (where algae-resistant shingles are available). 2. Damaged Flashing: Causes of Damaged Flashing can be: Improper installation on a new roof, Drying and cracking on an old roof, Dented by improper nailing, Settling of the structure. RECOMMENDATIONS: In most cases it is only necessary to remove and replace the flashing and shingles around the damaged area. 3. Buckling: Causes of Buckling can be from: Improperly applied felt, Wrinkled underlayment, Roof deck movement, Spacers not used in between roof deck boards, Poor roof ventilation, and/or New shingles applied over old, rough shingles. RECOMMENDATIONS: Allow moisture to escape the Roofing System. This can be a slow process and could take until the following spring. Once the Roofing System reaches the proper moisture content, the roof should lay flat and the buckling problem should not return. Remove the shingles that are affected. Cut the wrinkle in the felt and replace the shingles. Add ventilation to the attic space. The minimum requirement is one square foot of net free vent area per 150 square feet of attic floor space if a vapor retarder is not present. If a vapor retarder is present, the amount of required ventilation can be reduced to one square foot of net free vent area per 300 square feet of attic floor space. Consult the services of a professional. Make sure to apply shingles in accordance with the shingle manufacturer's recommendations. 4. Curling: Causes of Curling can be: High nails, Lack of back coating, Under-saturation of asphalt felt in organic shingles, Lack of ventilation, Improper number of fasteners. RECOMMENDATIONS: Check location and number of fasteners, Added roof ventilation can often correct this issue as well. 5. Blistering: Causes of Blistering can be: Moisture in the shingle. RECOMMENDATIONS: If the blisters break open revealing the asphalt, the affected shingles should be replaced. Consult with the manufacturer of the shingles. 6. Missing Shingles: Causes of Missing Shingles can be: Improper fastening or exposure to high winds. RECOMMENDATIONS: Replace shingles which have completely blown off. For shingles with tabs blowing up and down, hand seal the shingles with an asphalt plastic cement, commonly referred to as flashing cement. This roofing cement must comply with ASTM D4586 -- Type I or Type II which is the standard specifically for asbestos-free asphalt plastic roof cement. (Some products meeting this standard may involve hazardous materials. This bulletin does not purport to address all of the safety and health problems associated with the use of materials meeting this specification. It is the responsibility of the user to observe the safety and health practices as determined by the manufacturer of the product and stated on the label, instructions and Material Safety Data Sheet (MSDS). To hand seal, lift each tab of a 3-tab shingle and apply two spots of the cement under each tab. Each spot should be approximately the size of a quarter and placed 1" to 2" from each end of the tab and near the bottom. Laminated shingles require 4 spots of cement per shingle. After application, press the tab down firmly to start the bond. Be careful not to apply the cement too close to the bottom of the tab. This causes the cement to squeeze out when the tab is pressed down. 7. Ceiling Spots: Causes of Ceiling Spots are from leaks in the roof. RECOMMENDATIONS: Check the attic for leaks in deck. Check the chimney and vents for cracks in flashing. Check rafters for leaks that "travel" away from original source. Check eaves for water backing up from ice dams. Check roof for damaged shingles. 8. Missing Granules: Causes of Missing Granules can be: Normally a certain number of granules will be loose, especially after application. These granules are called "riders" and are a normal result of the manufacturing process. Granule loss does not affect the service life of the shingles unless granules can be seen missing on the surface of the shingles, thus exposing the asphalt or Fiberglas® mat. 9. Rotting: Rotting is caused by absorption of moisture by the mat at the core of the shingle. 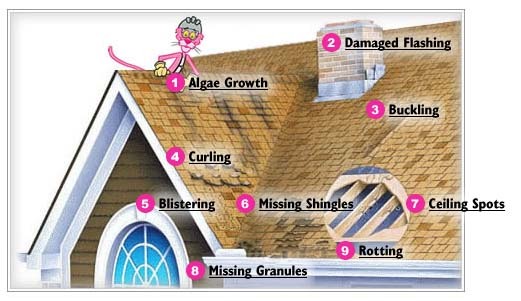 This is a common problem with organic-based shingles. RECOMMENDATIONS: Replace the roof shingles.